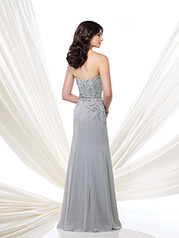 Strapless chiffon slim A-line gown with soft sweetheart neckline, hand-beaded bodice with belted natural waist, slim to flowing skirt, suitable for wedding guests and formal events. Matching shawl and removable straps included. Embellish by David Tutera bracelet and earring style Gina sold separately.